One of the most popular and viewed YouTube bands in the world, Boyce Avenue, will visit Australia again this December for a national tour. 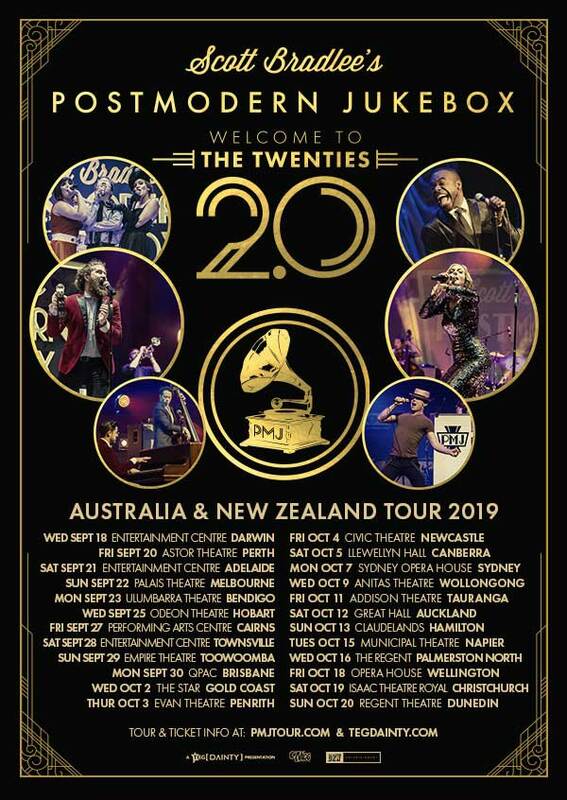 Joining them will be Sydney boy band In Stereo (all shows except Perth), Perth-based The Fisher Boys (Perth show only) and nineteen year old singer-songwriter Marcelo. Dubbed “the hottest boy band around right now” (Dolly Magazine), In Stereo took Australia by storm with their performance of Taylor Swift’s Style in the 2015 X-factor Auditions. Most recently In Stereo performed at Nickelodeon’s SLIMEFEST alongside local & international acts including Havana Brown, G.R.L. & Omi. Boyce Avenue is a Florida-based band that consists of three brothers Alejandro, Fabian, and Daniel Manzano. The brothers first came together as a band in 2004 and in 2007 decided to start filming and posting videos on YouTube. The videos resonated instantly with YouTube viewers, with the band’s YouTube channel amassing over 2.1 Billion views and over 7.5 Million subscribers to date, making them one of the biggest independent bands on the network. Boyce Avenue has also garnered over 500,000 Twitter followers and almost 3 million Facebook subscribers, forging a lasting and passionate digital fan base that have followed the band’s every move for years. In 2010, they released their debut album, All We Have Left. Boyce Avenue proudly release their music independently and have gone on to sell in excess of 10 Million singles and 500 Million streams to date, making them one of the most successful independent bands in the world. Their current album Road Less Traveled is out now and features the single Be Somebody that was produced by the Espionage production team (Beyonce – Irreplaceable, Train – Hey Soul Sister and others). 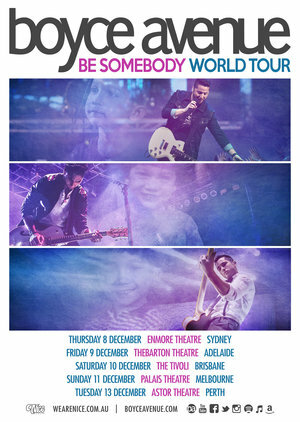 Boyce Avenue have also enjoyed massive touring success across the world. They were last in Australia in 2015 as part of the Nickelodeon Slimefest. This year they have been on the road with Australia’s own At Sunset and look forward to returning to our shores to enjoy the sun and meet their loyal fans.